The emblem of the most-expensive.coffee real & caged free certification. Producers who farm civet palms to get kopi luwak act unethically and destroy the natural taste of the beans. Wild civet cats select only the ripest cherries and do NOT blight it with stress enzymes unlike their caged relatives. The Internet is inundated with “dirty” kopi luwak, which is watered down with cheap coffee beans. Professional websites, beautiful packages and well-written descriptions attempt to deceive customers with high price imitations. Never trust a product which is not listed on this website! 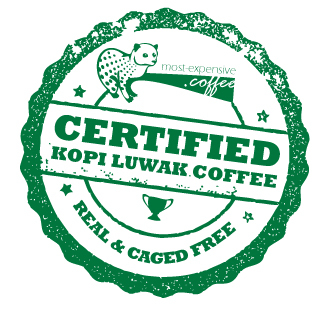 For other resellers “Luwak” could mean only 1% caged kopi luwak. Another criteria element which proves the coffee really comes from free-range luwaks. “Real” and “cage-free“doesn’t mean it REALLY comes from an animal, because there are chemical methods to fake “real” Kopi Luwak. 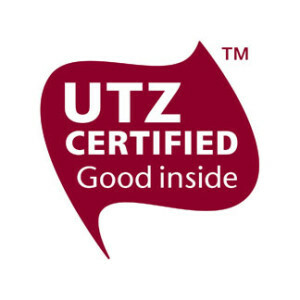 UTZ CERTIFIED is one of the largest sustainability programs for coffee, cocoa and tea in the world. In January 2014, a milestone in the business of the most expensive coffee was reached. Tony Wild, an important activist for cage- free Kopi Luwak, saw to it that “animal welfare” criteria was included in UTZ Certification. This is one of the most internationally respected coffee certifications providing assurance to the consumer that their coffee is produced in an ethical and sustainable manner. After this big news, the World Society for the Protection of Animals (WSPA) released a list of companies and resellers around the world which stopped offering Kopi Luwak in their stores. Harrods, Selfridges and Firebox were some of these ethical pioneers. It was clear these companies attached importance to ethical production and products. In May 2014, some of these companies restarted to sell Kopi Luwak again, but this time they offered civet coffee UTZ certified. We checked these products ourselves and they acted correctly: Absolute free-range Kopi Luwak was born. Furthermore, we started to analyze other aspects of Kopi Luwak offered this way, and we found that companies with UTZ certified civet coffees fulfill all relevant criteria for an authentic, real and ethically correct Kopi Luwak. 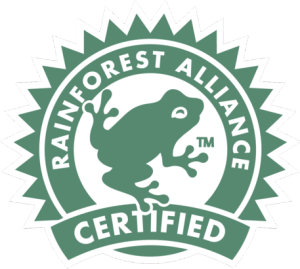 Another important seal of approval is the Rainforest Alliance. The “Rainforest Alliance Certification”, includes an ecosystem conservation program, protection of wild animals and waterways, prohibition of discrimination in work and hiring practices, prohibition of employing children under the age of 15, requires the use of protective gear for workers, provides guidelines about agrochemical use, and the prohibition of transgenic crops. The existance of this certification on a kopi luwak product is high-grade proof it was ethically produced.